The Pueblo County Sheriff’s Office said the bust, called “Operation Flypaper,” shut down the largest illegal marijuana grow operation in the county’s history — and one of the largest in the history of Colorado. The growing fields were estimated to be at least three years old and to have yielded in excess of $60 million in drug sales. Two men, both Mexican nationals, were arrested. At least five other men believed to have been part of the operation escaped. Authorities found tents, sleeping bags, cooking equipment, toiletries — and hundreds of empty beer cans. Aside from makeshift camp sites, the growing fields also were littered with hundreds of pounds of trash that included empty bottles of insecticide poured into local water sources. 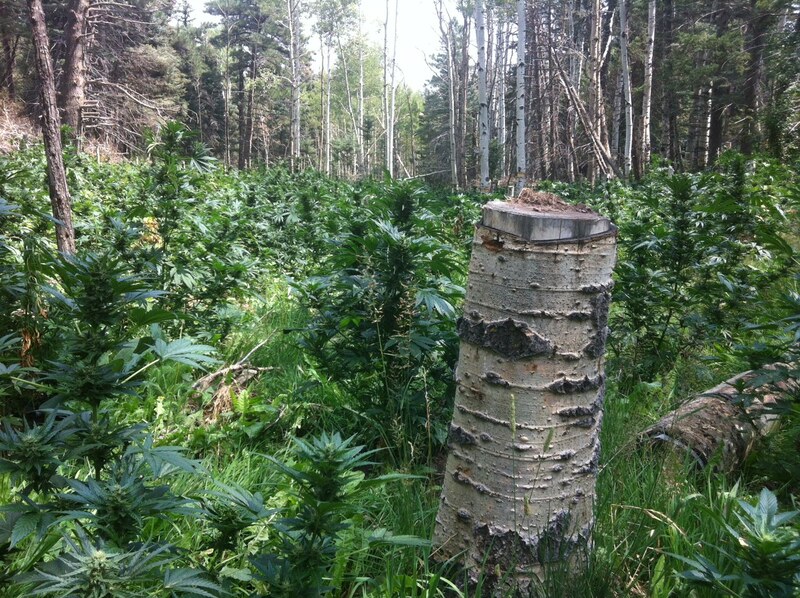 The growers had destroyed hundreds of trees to make way for the marijuana crop. The growing fields, near Colorado’s Lake Isabel, were on privately owned property, spanning thousands of wooded acres. The land’s owner discovered the operation earlier this year and alerted authorities. Local and state officials destroyed the grow operation, and federal authorities, working with the Colorado National Guard’s Joint Counterdrug Task Force, air-lifted the plants into waiting dump trucks that hauled them off for analysis and destruction. DrThurstone.com has exclusive photos of today’s government takedown of the grow operation. The marijuana destroyed today outside Pueblo is sold at cheaper rates than the potent strains of so-called “medical marijuana” peddled by dispensaries. Why is that important? Because this is the “product” most frequently purchased by price-sensitive teens. I am co-authoring a study that has found 65 percent of past-year, marijuana-using teens in Colorado who are not in substance abuse treatment are using marijuana that comes from grow operations like this one. Marijuana growers are destroying our environment. As previously noted, several states have authorized marijuana grow operations that love to tout their responsibility to the earth and environment — and yet we still have these very serious problems plaguing beautiful private and public lands and water. Legalized grow operations — which invite plenty of their own problems — haven’t curbed these black-market scourges. If you use marijuana, you are an accomplice to this. Thanks for your comment, Jo. We hope you — and others who read this post — will share it online through all of your social networks. And here’s a quick (shameless) plug: on the home page of this site, under the heading “Get the latest, greatest,” readers will see a box that invites them to submit their e-mail address to receive automatic alerts of Dr. T’s latest posts. Thank you for your work! This is an incredible article.